Ballads by John Coltrane Quartet. 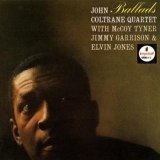 Ballads is ranked as the best album by John Coltrane Quartet. Members who like this album also like: Are You Experienced by The Jimi Hendrix Experience, Disraeli Gears by Cream and A Love Supreme by John Coltrane. Related links: top tracks by John Coltrane Quartettop tracks of the 1960s, top tracks of 1963. Showing latest 5 ratings for this album. | Show all 73 ratings for this album. A lot more passive compared to his work 60-61 and 65-67 yet still a beautiful collection of covers, very relaxing and immersive. I'm generally not to keen on this period of Coltrane's career (62-64) but this album is definitely a highlight. Very elegant and relaxing. I like the shorter song format and it really shows Coltrane's ability to change style as this was released around the same time as Giant Steps and Africa/Brass which have a far more modal and experimental sound. This album should be attributed to John Coltrane Quartet, not just John Coltrane. See album cover. A record made later in Coltrane's career as an attempt to be more commercial, because his more experimental material wasn't selling as well as he'd liked. Nonetheless, a sincere effort, and beautiful throughout, with Coltrane's great Quartet in top form. My favorite of his, but I generally prefer his more melodic stuff. Only knock: the songs do have a sameness about them; it can seem like one long ballad. (If you love Coltrane, that's not necessarily a bad thing.) Highlights: "Too Young to Go Steady," "Say It (Over and Over Again)" and "You Don't Know What Love Is."